Finally, in the 1st verse of the Book of Numbers, there are 17 words, like the 17 tefachim of the Menorah’s height (a tefach is a Biblical measurement of about one fist wide). Last, if we add all these (7+9+11+22), we’ll get 49, same as the numbers of days between Passover and Shavuot, or – the walk from slavery to freedom; to coming to Mt. Sinai to receive the Torah. Inside both words, Torah and Menorah, hides the word “or”, light. This was the first thing G-d created which immediately was defined as “good”. The Menorah is not a “thing” made of many parts, but rather – many parts of an indivisible One. What about the Menorah today? 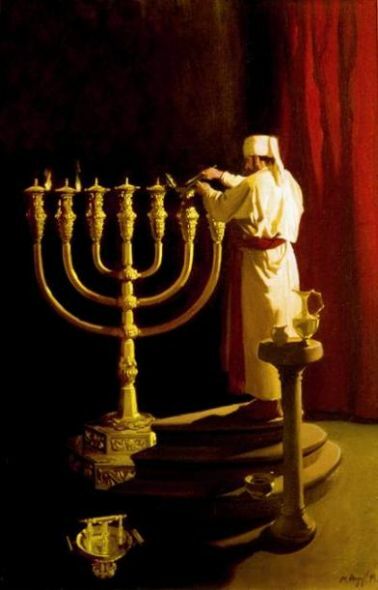 In the absence of the 17 tefachim tall Menorah, each one of us has to work on our own “little light”, and as the name of the Torah portion suggests, bring it up. At the end of Numbers, chapter 10, there are two upside “nun’s” (the Hebrew letter), around two famous verses, dividing the Book of Numbers into 3 sections (until then, these 2 verses and what’s going to come after). We’re used to the Torah the way it is, but a second look reveals that the Torah should have ended right there, with the Children of Israel traveling “a three days’ journey to seek out a resting place for them” (Numbers 10:33). What happened? Paul Simon says, “the nearer your destination, the more you’re slip slidin’ away”…But the People were not ready; and neither was Moshe. Before we know it, chapter 11 opens up with complaints, and soon (next week), we’ll have another (almost) 40 years added to our time in the desert. As part of learning at Yeshivat Maharat, students have to complete at least one unit of CPE, Clinical Pastoral Education, training us in chaplaincy. I was excited to have been accepted to the program at Bellevue Hospital, which, founded in 1736, is the oldest public hospital in the U.S.. Today, almost at the end of my first week, I am glad I chose to come here. This will be where I’ll spend much of my summer hours going forward, as well as some evenings and weekends shifts (Sundays, thanks to an interfaith cohort!). We’re learning techniques, potential challenges and possible situations. It promises to be quite intense. At the end of this week’s reading, Moses offers the shortest prayer in the Torah, and he does so, for Miriam’s quick recovery, even though she might have spoken badly about his wife: —- “Please G-d, heal her, please”! (Numbers 12:13). I am reminded of it when our supervisor teaches us the art of silence. There is so much that can be done with so few words.